So, I had this idea … what if I wrote a poem and delivered bits and pieces of it (let’s call them stanzas, shall we?) to a few friends in online spaces and asked them to piece the poem together over social media? What would that look like? How would you even pull it off? And this began an adventure this weekend with three of my friends — Charlene, Sheri and Terry — as I launched a poem like a balloon and watched it wander off. My goal as a writer in digital spaces was to try to figure out how to make this kind of playfulness meaningful and to extend out the poem’s life beyond me writing it and me publishing it. It helped that I know Terry, Sheri and Charlene are game for the oddness of play, as we all were deeply involved in the Making Learning Connected MOOC experience over the last two summers. In the end, what I decided to do was make the poem a puzzle. 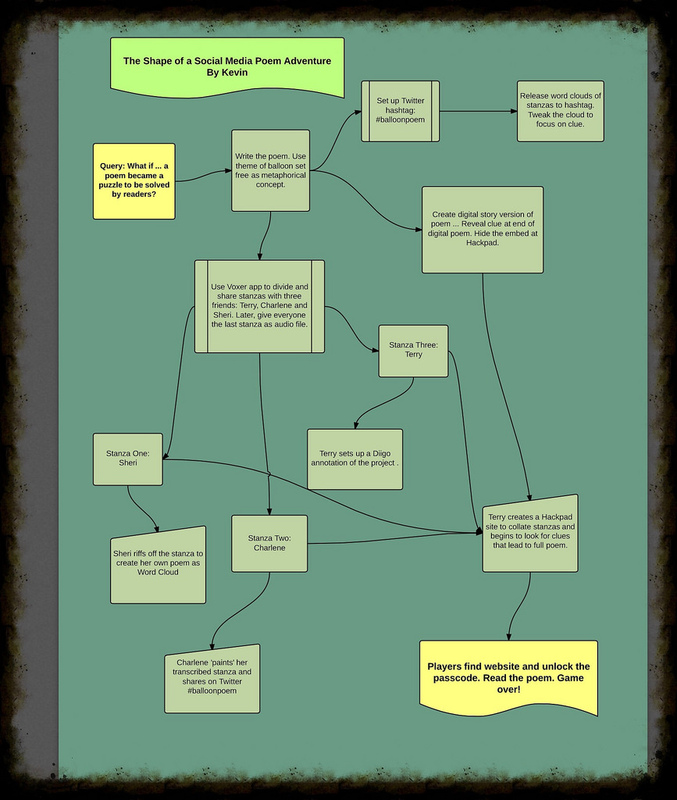 The embedded Thinglink here is an annotated version of a flowchart that I created (first, on scrap paper, and then later, with an app) to try to show what happened to the poem and the puzzle over the weekend. The challenge for them was to find their way to the website where the entire poem was published — all four stanzas (they only each received a single stanza, in isolation). I put the poem a link beyond a password-protected website that I set up, and their task was to coordinate together to find the code word that would unlock the website that would lead them to the poem. Along the way, they made their own poems and pictures and websites, and used a hashtag on Twitter to share (and for me to give out clues). It was fun to watch unfold — using writing and social media as “game” for reading, listening and collaborating, and trying to coordinate it from afar took some doing. But I think a variation of this kind of activity could be used as a model for how to think of literacy in the context of social media and social gathering. Charlene later asked, how could this translate into a classroom experience? Good question and one I am still mulling over. I suspect you could replicate it in offline space by using stanzas of poems as clues to some larger mystery that students have to collaboratively solve. Or have students create the poems that become the clues … there are possibilities.